As a historian (once upon a time I was a history teacher) visiting Uluru gave me the opportunity to understand more about the continent I now call home and of the indigenous people who have lived in Australia for thousands of years. They are the oldest continuous culture on earth. Before talking more about Uluru -Kata Tjuta it is important to understand about the people who have lived in this area for many millennia. 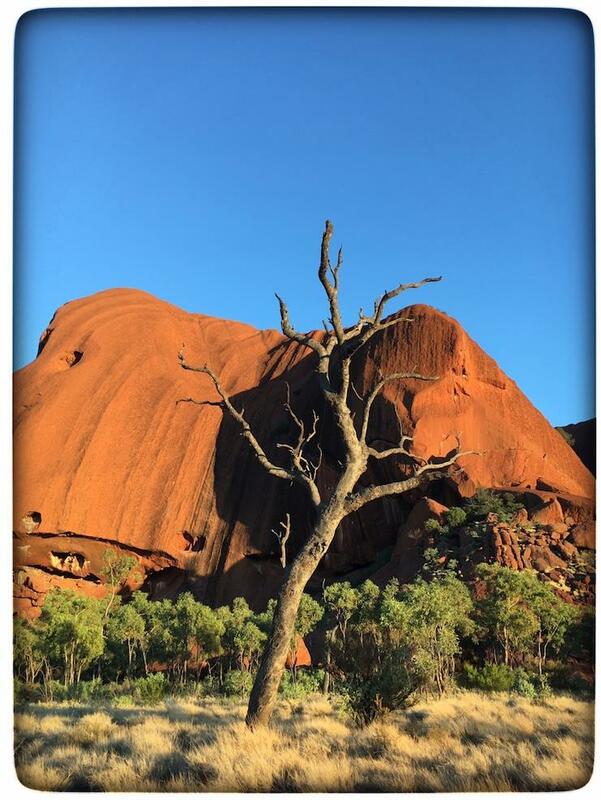 The Anangu (meaning ‘people’ in their native languages of Pitjantjatjara) are the traditional owners of Uluru -Kata Tjuta and the land around. 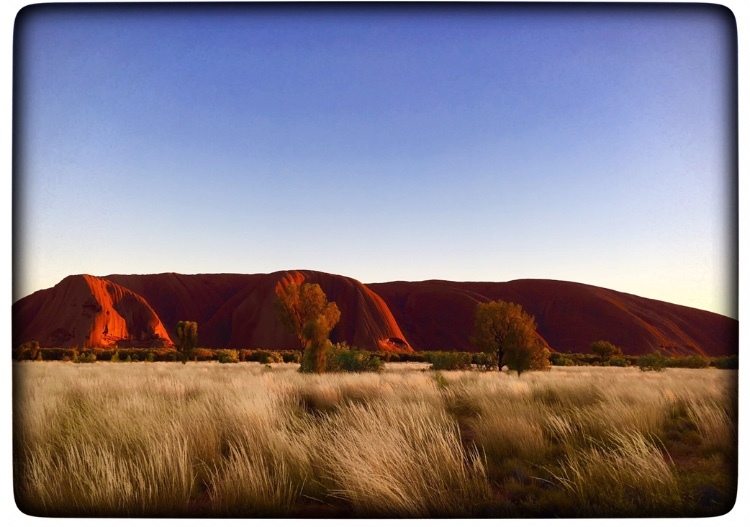 For the Anangu Uluru is not just a rock it is a living place. Tjukurpa or Anangu law is the foundation of their life and society and forms the basis of all relationships. The Tjukurpa is the ancestral period of when the world was being formed. The Tjukurpa has been passed down through thousands of years from generation to generation with elder people passing on this knowledge through stories, rituals, ceremonies, songs, dances and art. In the early 1900’s the land was declared to belong to the Australian government and it was only on 26th October 1985 that the Anangu were handed back their land. The area is now jointly managed between the Anangu and Parks Australia. The Uluru-Kata Tjuta National Park expands across more than 327,414 acres and was recognised by UNESCO in 1987 as a World Heritage Area for both its natural and cultural values. 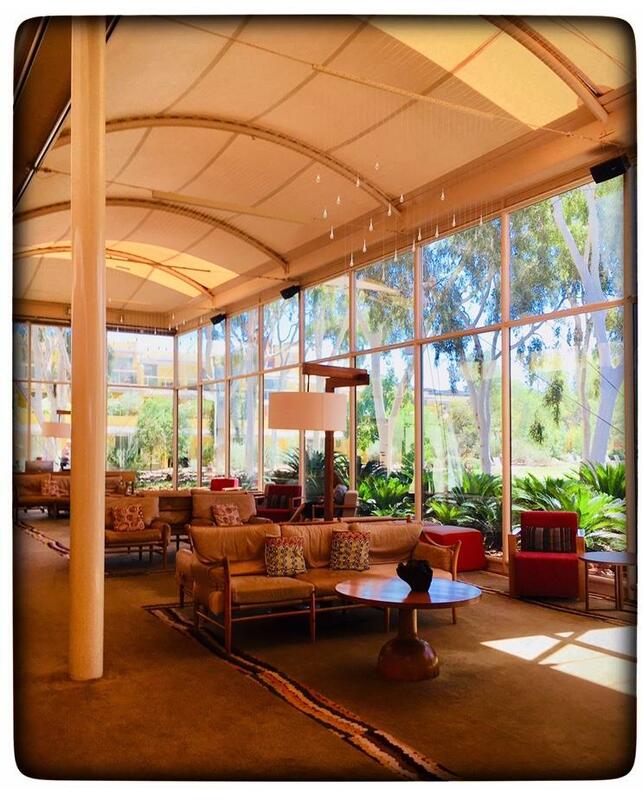 To find out more about the Anangu visit the cultural centre in the park. Before going into more detail about the park and Uluru/Kata-Tjuta I am going to mention that some of the areas in the park around Uluru and Kata Tjuta are considered sacred to the traditional owners and cannot be visited or photographed out of respect for the Anangu. These areas are clearly marked and if you are not on a tour it is possible to pick up a map from the cultural centre which has these areas specifically indicated. 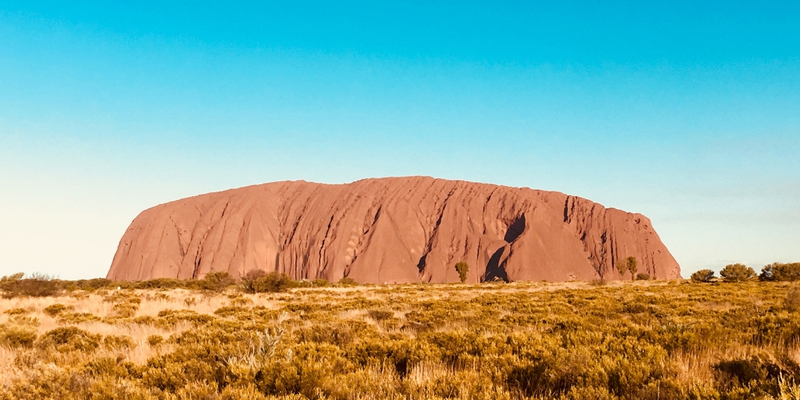 This includes climbing Uluru – whilst not yet banned until 2019 – the Anangu specifically ask visitors to NOT climb the monolith. So why would you? In my view it shows cultural insensitivity and is also quite frankly an unsafe thing to do. The climb is steep and arduous and many people have died attempting it. So just don’t. Uluru or Ayers Rock is one of the largest monoliths in the world and is 348 metres high, 3.6 km long, 1.9km wide and has a base measuring 9.4 kms. To geologists Uluru is an iselberg or island mountain with most of it being underground (like an iceberg but made of rock is the way I think of it). Uluru is made of sandstone and was created through the erosion of nearby mountain ranges millions of years ago. Uluru was named “Ayer’s Rock” by William Gosse one of the first European explorers in the area in 1873 after the Chief Secretary of South Australia, Sir Henry Ayers. In the early 1900’s European settlers encroached more and more onto Anangu land and caused much hardship through depletion of the natural resources the Anangu relied on for survival. In the 1930’s the Anangu had contact with dingo hunters or “doggers” and became involved in trade. European settlement followed and the tourist industry around Uluru started. 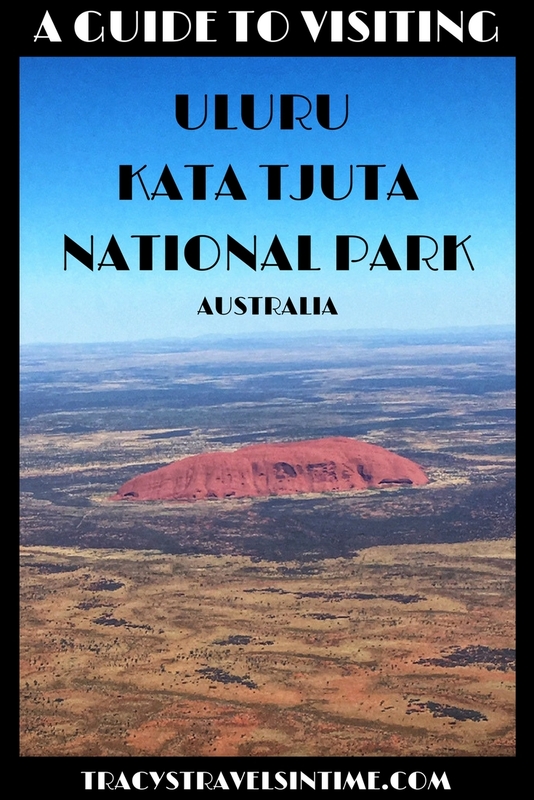 I think everyone has heard of Uluru but what about Kata-Tjuta? Kata Tjuta is about 25 kms west of Uluru. It consists of 36 domes and at 546 m (1,791 ft) above the ground is about 198m higher than Uluru. Kata Tjuta means “many heads” in the Anangu language Pitjantjatjara. It is also an iselberg but it is made up of sedimentary deposits which have over time broken up into boulders and is believed to have been created during the same time period as Uluru. Kata Tjuta is also referred to as “The Olgas”. This was the name given by the explorer Ernest Giles in 1872 in honour of Queen Olga of Württemberg. Today they are given both names though I will stick to the traditional Anangu name of Kata Tjuta. There are only a few ways to get to Uluru-Kata Tjuta National Park and they involve either a long drive or plane ride! Both Jetstar and Virgin Australia fly daily directly into Ayers Rock Airport from Sydney. Jetstar has a 4 weekly return service from Melbourne Tullamarine into Ayers Rock Airport. Qantas also operates daily flights via Alice Springs, and direct flights from Cairns and Alice Springs to Ayers Rock. Direct flights are also now available from Brisbane. You can drive the 468 kms from Alice Springs to Uluru and this will take around 5 hours. On sealed roads too so no need for a 4×4. So fly into Alice Springs (or bus it from one of the cities) then hire a car and drive. Driving the famous Red Centre Way in Northern Territories will give you a chance to explore not only Uluru but Kings Canyon, the West MacDonnell Ranges and Alice Springs too. HOT TIP! I am not 100% guaranteeing this but we sat on the left of the plane on our way in and the right on our way out and had the most perfect view of Uluru. 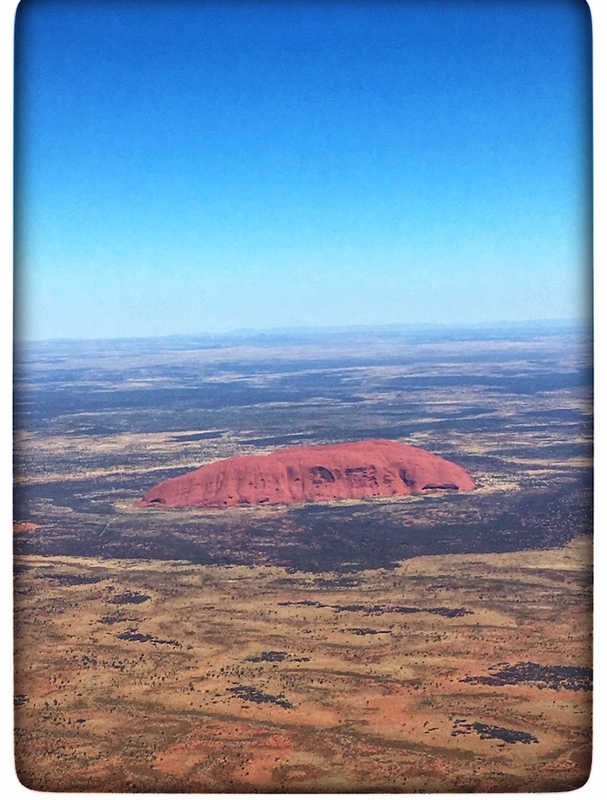 There was something so awe inspiring about seeing Uluru from the air as we approached the airport. consider this when booking your seats on the plane. VISITING ULURU-KATA TJUTA – WHERE TO STAY? 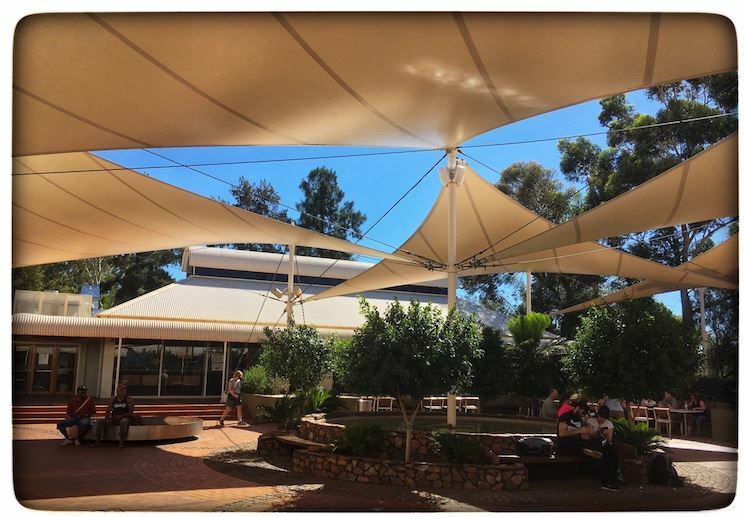 There is no accommodation or camping available inside Uluru-Kata Tjuta National Park but Ayers Rock Resort is about a 10 minute drive from the park and about a 10 minute drive from Ayers Rock Airport in Yulara. This is a 5* hotel which offers luxury accommodation. We stayed at this hotel and I will be reviewing our experience shortly. This 4.5* hotel is set within an oasis of native gardens. One or two-bedroomed self-contained apartments. A 3* hotel which offers visitors rooms with a private bathroom. This offers powered campsites as well as air conditioned cabins for visitors. It is useful to know what is available if you stay in the resort at Yulara. We didn’t know what was available before we arrived but this information will be very useful next time we go (we are planning to drive next time) We were able to pick up fly nets at the resort quite cheaply. The Town Square is a short walk from all the accommodation in the resort. So once you have sorted out how to get there and where to stay the next question is what do we want to do when we are there! There are a huge number of tours in Uluru that you can choose from and book for your stay. We took a 5 tours which I will look at one by one (and give a rating!) to help you decide what you would like to see and do when visiting and choosing your tours in Uluru. This art installation by British artist Bruce Munro has been extended until 31 December 2020. There are many ways you can see the “Field of Lights” and we chose “A night at the Field of Lights” tour. This combines the famous “Sounds of Silence” dining experience with the opportunity to see the lights. The exhibition comprises of 50,000 stems, over 380 kms of optical fibre and covers and area the size of nearly 7 football fields. It is also solar powered. After a drink and canapes watching the sunset over Uluru you will be seated for your 3 course meal. This was a magical experience and enjoying our food with a glass of wine in this amazing part of the world will be a lifelong memory. Due to the lack of light pollution you also have the opportunity to appreciate the night sky with a talk from an expert to point out the southern cross and other stars which appear so clearly in the sky. After the meal we were taken to the Field of Lights for a self-guided walk. It was beautiful. At $245 per person this tour is not cheap but it was something unique and I would highly recommend it. We did both! On the first evening we booked a BBQ dinner whilst enjoying the sunset and a few days later we took a sunrise tour. My favourite was the sunrise tour with SEIT Outback Australia. The sunset tour was Ok but there was a LOT of people around and it felt a little chaotic (this was not a tour with SEIT). In fact SEIT were so good I am glad we booked the majority of our tours with them. 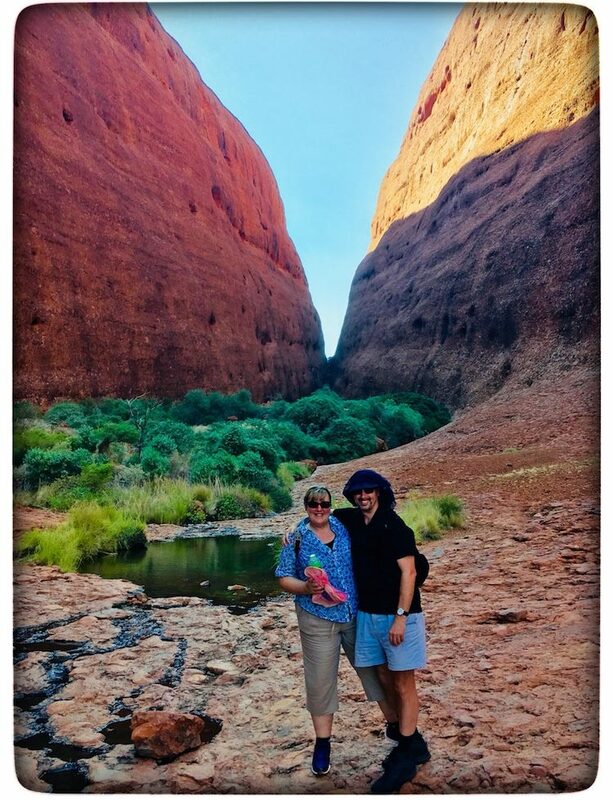 We took the Seit Uluru Highlights Tour – this is a 3 hour tour which included seeing the sunrise at Uluru followed by breakfast and a visit to the Mutijulu Waterhole on the Kuniya Walk. Whilst on the tour we learnt about the Creation stories of Liru (poisonous snake) and Kuniya (python) before driving around the base. We loved the Kata Tjuta tour with Seit and our guide Valerie was absolutely amazing. She knew so much and we learnt so much! 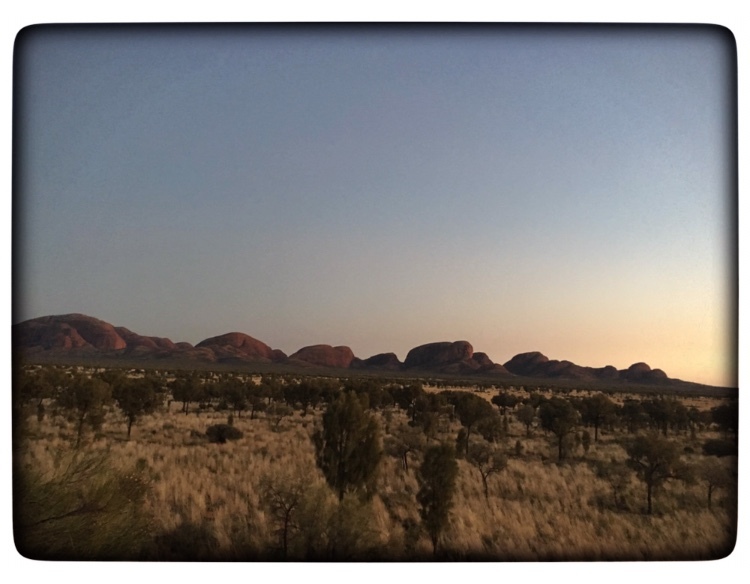 We started the tour at a great look-out which meant we had a great view of sunrise over both Uluru and Kata Tjuta. After the sunrise we had breakfast before heading off for a hike down Walpa Gorge at Kata Tjuta. It isn’t a long hike – approximately 1.3 kms but the rocks are uneven and there are some steeper bits so you do need good walking shoes/footwear. This is a 5 hour tour. Gary gave us his undivided attention as we were the only people on this tour. This was another SEIT tour. The tour took 2 hours. We walked to look at some of the native plants in the area before being shown some of the traditional tools used by Anangu men and women. We then had the chance to try some of the different plants and berries before handling some of the native wildlife (a snake and a skink). There are 21 mammals, 73 reptiles, and 178 bird species in the park so it was great to learn about some of them! As you can see I have given every tour a 5/5 as they were ALL amazing. I am giving Valerie’s tour of Kata Tjuta a 6/5 lol as her tour was the one we just loved the most! To give you an idea of what you can fit into 3 days at Uluru I will share our itinerary with you. We had a pretty busy time and so bear in mind the early starts/late nights you can have on some of the tours so adjust as necessary! Note there are no taxis in Yulara so ensure you book a transfer through your hotel (unless you are picking up a hire car of course – which are available at the airport). Transfer to the resort takes about 15 minutes and if you weren’t lucky enough to see Uluru from the air this will be your first sighting! BBQ Sunset tour at Uluru. For your first evening I would suggest going to see your first sunset at Uluru. The park closes by 8 pm in April so your tour providers will have you back to the hotel before then so you get an early night which will help in the morning! Sunrise tour! As mentioned above we took the Kata Tjuta tour with Seit Outback Tours on the first morning. 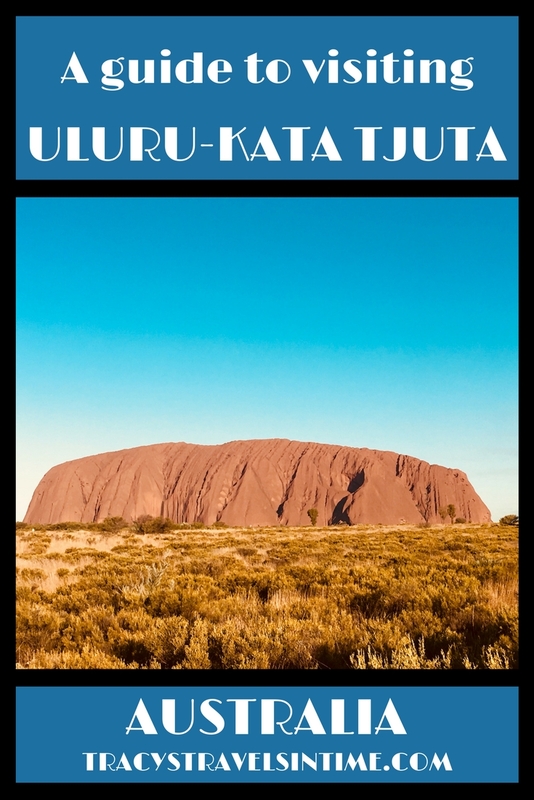 I would highly recommend this tour as you are on a viewing platform that not only enables you to watch sunrise over Kata Tjuta but also rising next to Uluru which is beautiful. It is an early pick up but obviously the only way to see sunrise if to be up before the sun! We spent the rest of the day relaxing by the pool and enjoying the wonderful facilities available at the hotel. On our second evening we booked the Field of Light tour. This meant a 5.45 pm pick-up and we were back just after 11 pm. The Field of Light is not situated within the park itself so they are not effected by the 8 pm (in April) curfew. Another early start! 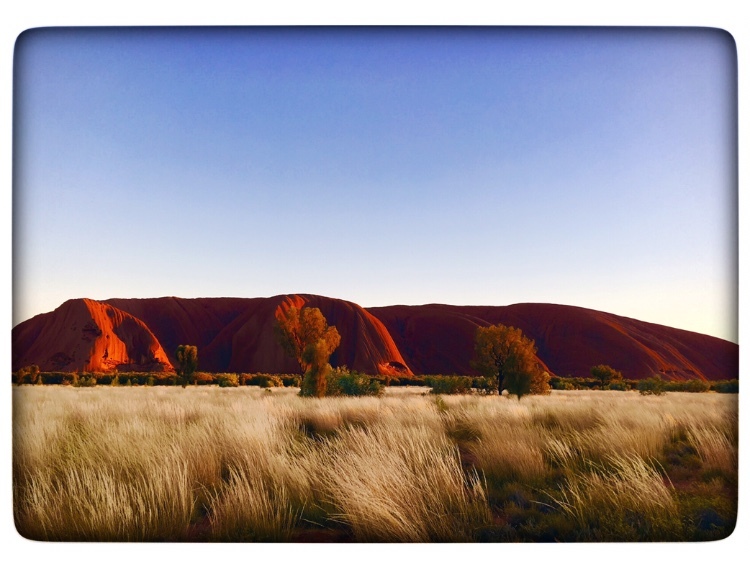 This time we took the 3 hour Seit Uluru highlights tour as mentioned above. This again meant an early 5.45 am start but we were back to the hotel by 9 am for a quick turnaround before taking our last tour of the trip. 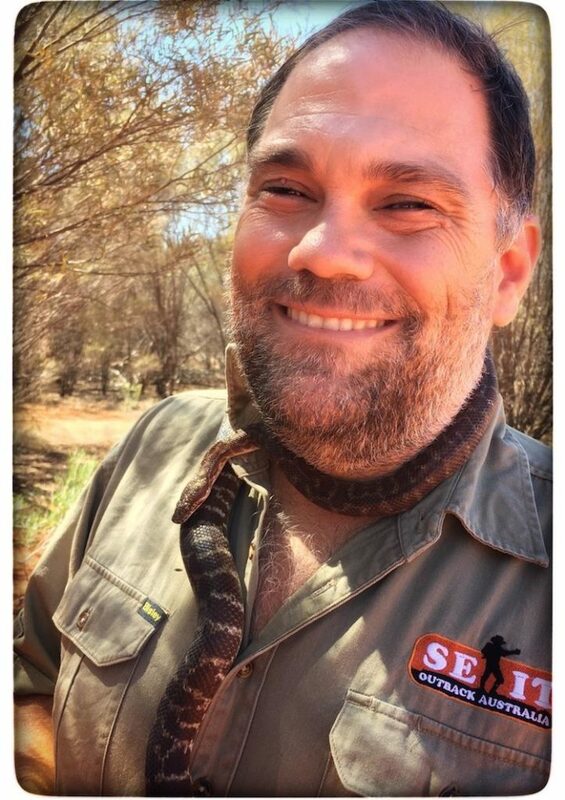 The 2 hour SEIT bush tucker and reptiles tour was interesting and informative. When to visit – the Uluru Australia weather forecast? I would recommend the cooler months as sunrise is later so not too many early mornings to see sunrise. If you do decide to visit in summer visit the park early in the day and avoid any walks after 11 am. It costs $25 to enter the park. This ticket lasts for 3 days and everyone needs to buy one. Free wifi is available at the Cultural Centre in Uluru and there are some great apps you can download before you enter the park to0. 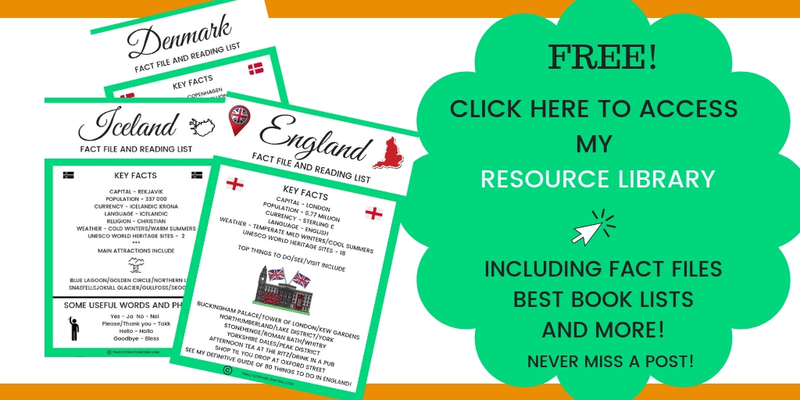 Whatever season you decide to visit there are some essentials you need to have with you! A water bottle – absolutely essential. It is easy to become dehydrated so make sure you have water with you at all times. The recommended amount is 1 litre per hour I believe. Sun cream – again an essential. A fly net. Go without one at your peril. I had one and still managed to eat a fly. Strong, comfortable, flat walking shoes. I saw someone walking the Walpa Gorge in thongs (flipflops) which was crazy! The park receives over 250,000 visitors a year and we all need to do our bit to make sure that all we leave behind are our footprints. Take all your rubbish away with you! Do not take sand, rocks, plants or anything else from the park – we saw some people put rocks in their bag. Just no. There are toilets in the park at the Cultural Centre, Mala carpark, Talinguru Nyakunytjaku and at the Kata Tjuta Sunset Viewing area. Stick to walks and paths they are clearly marked. 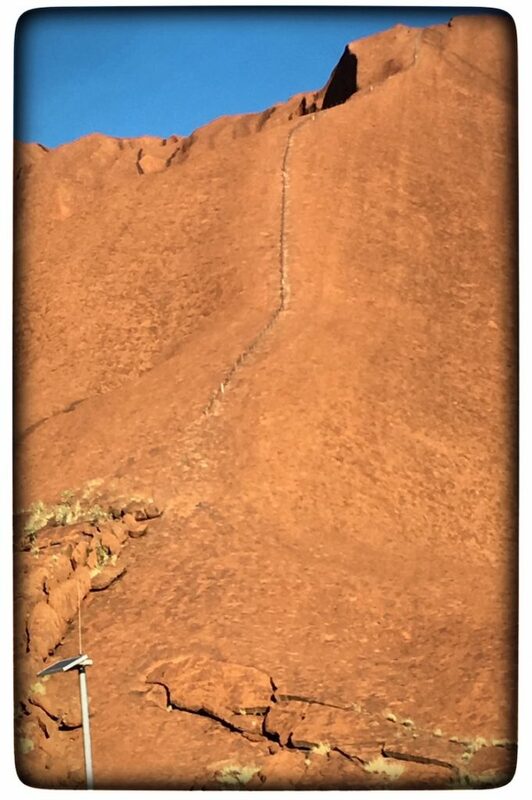 Note that there are NO toilets at the top of Uluru. If you decide to climb it and then need the loo what will you do? Not a nice thought considering rains will wash whatever it is you leave behind from the top into the water holes at the bottom. If you are visiting Uluru soon or are just considering a trip I hope this has been useful to help with your planning. We loved our trip. Next time we are hoping to drive and spend more time in what is truly the red heart of Australia. 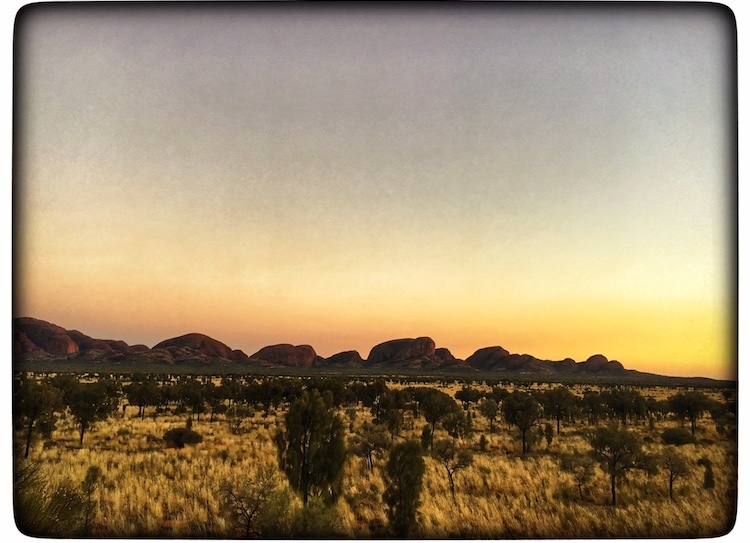 The Anangu are the traditional owners of Uluru and Kata Tjuta and the land that surrounds it. I pay respects to Anangu elders past, present and emerging. I’d really love to make it here – it seems like a mythical place. I would definitely say to go! It’s so terrible that I’m from Australia and lived there for a good 30 years (give or take a few) and never got to NT or Uluru. But reading posts about it (and other meaningful Aussie places) makes me want to go back home and travel there properly. There are so many amazing places in Australia and Uluru is top for us! Wow your photos look so amazing! The landscape is so unique and beautiful! This is a really informative and sensitively written post, thank you so much for sharing with the #feetdotravel tribe. It looks like a wonderful place to visit and I’ve pinned your post for later. “They are the oldest continuous culture on earth.” I never knew this! Oh, I loved visiting Uluru and Kata Tjuta. We went along with the 3 day Rock Tour from Alice Springs. It was a great trip. It started raining once we got to Uluru and for just 30 minutes we saw waterfalls coming off the big rock. It was amazing. Apparently only 1% of people see that so that is amazing!Wow so lucky! Great guide. I am forwarding this on to my daughter who has just moved to Australia and this is first on her list to travel to. What a great rock formation to explore! I would enjoy all of the activities you’ve shown except the reptiles — skipping that one! This does look like a beautiful place to visit. I understand and like to respect other people’s cultures. I know that many people find it offensive to take photos in churches. However, photographing sites that are in open air seems different. Why would it be sacrilegious to photograph a mountain? Climbing it, well, that makes sense, but photographing it? Perhaps I didn’t explain it properly in the article but to the Anangu Uluru is sacred and in their culture there are sacred sites around it for men and women – these sites cannot be seen only by the initiated men or women. 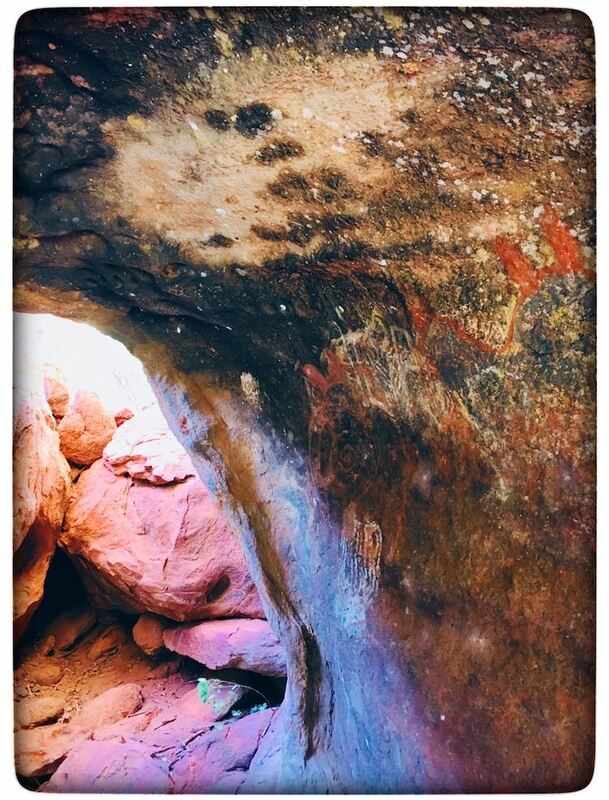 So if photographs are taken of the sacred sites and shared and then seen by Anangu they will have inadvertently seen things they are not allowed to see. I hope that makes sense. Also it is in the open air but it is the same as if it was a man-made structure for many religions like a church. Anangu believe that their culture is degraded if pictures or video of scared sites are taken or displayed. It is their wishes so I respect that – they are the traditional owners and it is a privilege to be able to visit and see such an amazing place. It is so much more than a rock. My son read a book about Uluru (So random) and has been obsessed with wanting to go to Australia and this rock! Beautiful pics! Thank-you! I would take him! He will love it I am sure! Lovely and informative post! Never really considered visiting Uluru before but it actually does look really cool. Also unrelated: LOVE your page header! Thank-you! You are the second person who has said that recently and I am thinking of changing it! Maybe I should keep it!! It can be expensive though for us a lot cheaper now as Jetstar have just announced direct flights from Brisbane! We visited Ayers Rock a few years ago. I had also been there as a teenager. While Ayers Rock is magnificent my favourite was The Olgas. There was a walk there called The Valley of the Winds, the first part of which was really stunning. We also went to Kings Canyon which I can highly recommend. We loved Kata Tjuta too (The Olgas) and took the gorge walk but will definitely look into the Valley of the Winds walk next time! It is a fantastic place to visit – we can’t wait to go back and explore more of the area! Thanks Kreete – it was an absolutely fabulous trip! I think you would love it there – I think it should be compulsory for all Australians to go. It just is such a special place. Tracy, your Australia posts have made me so happy. I am moving there in a few years and needed this encouragement coming from Canada. Hubby is from Sydney originally with his family living on the Gold Coast. Uluru is a spot I have always wanted to go and he has told me he would like to take me there for a special occasion. Your post truly has me excited about seeing it some day! Thank you for coming to Fly Away Friday! See you tomorrow! We must meet up when you move back Janine! Yes Uluru really is one of the most amazing places i have ever been I am sure you will love it! Thanks Kana! Will be back asap!